by Rob - April 14th, 2016. Filed under: Quantum Night, Reviews. “This is one `hard SF’ book that manages to throw in large information dumps without boring the reader! The information — and one thing Rob Sawyer is well known for — is necessary to the plot, and extremely well researched, but somehow (and this is a very rare thing) manages to keep the reader alert and involved with the story. “Rather than a dry discussion on philosophical points, Quantum Night takes you on an exciting ride through a scientific extrapolation in the near-future time of 2020 — only four years away from now — when the US has a new President who seems not to share the conciliatory nature of Barack Obama; when Justin Trudeau’s government is only surviving through a coalition with the NDP (Canadians will understand what that means), and where the entire world seems to be falling into a crevasse of mindless violence where the highest mentality is mob mentality. “This book makes you want to follow up on all those things mentioned by Sawyer: what are `microsaccades,’ is quantum superposition a real force in neurology, what does it mean to be `neurotypical’? After reading this I spent a couple of days with Google, tracing down paper after paper to find out what’s real and what’s extrapolation. “Quantum Night is simultaneously a breath of fresh air and a return to classic Sawyer: big ideas, relatable people and a Canadian perspective. This is trademark Sawyer. “Though returning to a favourite topic — the nature of consciousness — he doesn’t retread any old ground here, taking an entirely new angle and approach. 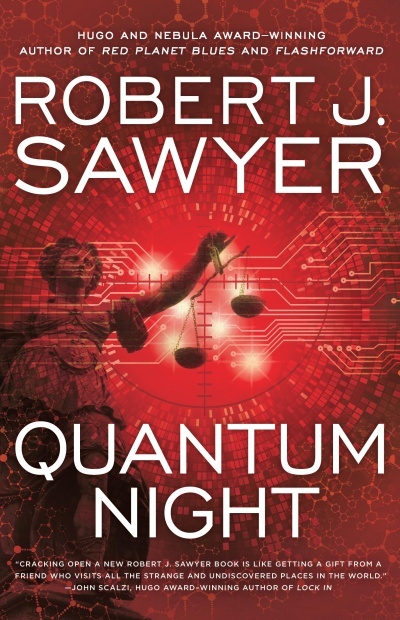 “Quantum Night by Robert J. Sawyer is a highly recommended science fiction novel set in the near future — with psychopaths, and philosophical zombies. “Sawyer is an accomplished writer who knows how to give his readers the science they need while keeping the plot flowing. He uses Jim’s lectures to his class in-between chapters to help impart information about psychology and ethics that will be used in the novel. The science and research in the novel is based on fact and Sawyer includes a sizable section of further nonfiction reading that influence his plot and the research within the narrative. “Robert J. Sawyer’s first new novel in three years is his familiar enjoyable blend of science-based extrapolation, strong characterisation, plot twists, philosophical treatise, pop culture references, bad jokes and high stakes, which I suspect will increase the sales of many of the texts the author quotes in his afterword, since it’s an eye-opening look into our understanding of human consciousness (pun, for those who’ve read the book, fully intended). It’s a subject Sawyer has tackled before — there’s even a fun throwaway line about the FlashForward TV show — but he comes at it from a very different angle on this occasion. “It’s Sawyer’s most blatantly Canadian book — there’s a considerable amount of detail about the locations in which it’s set. It’s not a paean of praise to his home country, however; in places it’s an almost forensic examination of the cultural and political differences between Canada and its neighbour, which become highly relevant to the book’s third act. The various philosophical discussions that underpin the first two acts are equally important to the denouement; Sawyer reinforces the differing sides of the arguments regarding utilitarianism with deftly chosen pop culture references (Star Trek II unsurprisingly turning up in this, alongside a savage dismissal of its sequel!) as well as through his characters. “As with all Sawyer’s best novels (of which this is one), the discussions come out of the plot and character development, and there are many taut action sequences that will have you powering through the pages — but it is the concepts at its heart that will reverberate through your thoughts for some time to come. “Mind-blowing. What Sawyer does, possibly better than anyone else, is take a new scientific theory and extrapolate its real-world effects to their logical extremes. Then he tosses some Canadian, Star-Trek-quoting academics at it to see what happens. “Which are you? Are you a sheep, a psychopath or an intellectual? It is a thesis that superstar science-fiction writer Robert J. Sawyer poses in his latest novel Quantum Night. It is an academic paper given the gift of action, adventure, romance and all the other trappings of dramatic storytelling that Sawyer has become world famous for. His discussion, like the book itself, is a made up story, yes, but it is also a button Sawyer is pushing to get the reader thinking about, well, thinking. “Where to start in recommending Quantum Night? Robert J. Sawyer’s new novel is set in the very near future. The author has created a plausible, unpleasant future in which new discoveries in psychology and quantum physics might be the only hope for stemming a rising tide of violence and unrest. The novel is fast-paced and thoroughly engaging, questioning what we should do to save humanity given the necessary knowledge and technology. « Door prizes for Toronto launch party! Excellent read-enjojed too much.A potential best-seller & confabulation.